Are you looking for a way to spice up your cooking? Do you want to inject a ton of flavor into what you are making without having to take a ton of time out of your day to cook? Are you sick of having to throw good flavor away because you need to cook quickly? Do you want the rich, crisp flavor of fried foods, but don’t want to shell out all of that money for a high end, restaurant grade fryer? If that’s the case, we have just the thing for you. The T-fal FR8000 fryer is one of the best deep fryers on the market. You are going to get full-flavored fried foods with the perfect texture and flavor. Not sure if getting this quality fryer is the right choice for you? No worries, because we are going to give you a little overview of this quality fryer including features and a list of pros and cons about the product. 4 Who is this not for? If you like it, the chances are that you can probably fry it. This fryer gives you virtually limitless potential of the foods that you can fry from chicken wings and cheese sticks to cheesecake and ice cream. This is an immersion deep fryer that heats the oil fast and keeps it up to cooking temperature. Whenever you deep fry your food, it is important to control temperature at the right level. This will help prevent oil from penetrating your food and make it greasy. The oil temperature usually goes up with you put food in it. Therefore, the immersion system will help stabilize the temperature. When you are frying different kinds of foods with your fryer, you are going to need a thermostat control system so that you can make sure that you fry all of your foods at the right temperature. The T-fal FR8000 fryer has an advanced temperature control system. It comes with a lot of great presets that you can use for just about anything, and it also has a custom temperature control that you can use to fry a variety of foods. The T-fal FR8000 fryer has a custom oil filtration system that really separates it from the rest of the crowd. What this oil filtration system can do that is so amazing is that it drains, filters, and stores your oils safely for future use. That way you don’t have to deal with the constant hassle of filling your fryer, using it, empty the old oil, and refilling it with new oil every time that you want to cook. That makes this fryer a huge cost-saver, and also really environmentally friendly. 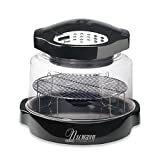 This unique fryer has a handle that stays cool while you are frying, so that you never have to worry about burning yourself while you are using your fryer. It is a 1700 watt fryer, which makes it super powerful for its class, and it holds up to 3.5 liters of oil in it, which means that you can fry 2.5 pounds of food at a time in the T-fal FR8000. This fryer also has an easy to use 2 position basket for cooking and draining foods, which is nice touch. Anyone who wants to be able to make amazing fried foods, from the comfort of their own home. Anyone who is a gourmet chef or a professional cook may find this fun machine a bit lackluster for their level of expertise. An T-fal FR8000 deep fryer is an awesome kitchen appliance for anyone who loves the taste of fried foods, but wants something more than your average, cheap fryer. This fryer is loaded with a ton of quality features that make it sit at a cut above the rest of the competition.